Greg Henning is a longtime prosecutor. The Suffolk district attorney’s race has six candidates but Boston police have overwhelmingly contributed to one: Greg Henning, a longtime prosecutor and leader of the gang unit, an office that works closely with officers and detectives. In the crowded field of hopefuls, Henning, 38, stands out not only for his large war chest — about $493,000 — but also for the robust support from the police, who as of Aug. 24 had donated at least $64,000 to his campaign, according to a Globe review of campaign donations filed with the state Office of Campaign and Political Finance. 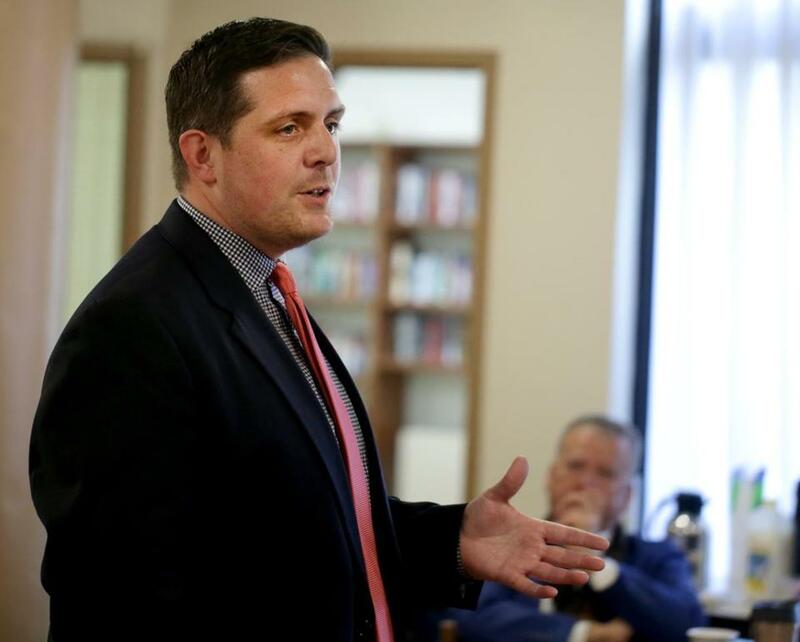 In a race where forums have been dominated by questions about how to reform the criminal justice system, Henning’s opponents have used the donations to define him as a candidate who will spurn those efforts, particularly increasing police accountability. Henning is the only candidate who has said he would not appoint a special prosecutor outside of the county to investigate police-involved shootings. In an interview, Henning rebuffed criticism that the donations would tie him to one special interest group. He said he has also received support from retired judges, defense attorneys, and teachers. Michael Talbot, vice president of governmental affairs for the Fraternal Order of Police and a sergeant detective for Boston, said Henning has worked for the past decade with dozens of officers in the department on complex gun and assault cases that required sensitivity for witnesses putting themselves at risk. Former commissioner Edward F. Davis also endorsed Henning. “We just want a strong DA with a history of prosecution and dealing with victims and witnesses,” said Talbot, stressing that he was speaking in his role as a governmental affairs leader. Henning is vying for the Democratic nomination along with Rollins, Champion, Evandro Carvalho, and Shannon McAuliffe. Carvalho is a state representative who also served as a prosecutor in Suffolk. McAuliffe is a longtime defense attorney who practiced for 12 years in the county. The winner will face independent Michael Maloney in the November general election. In recent years, increased attention to the role of a district attorney has resulted in an unusually high influx of cash for a race that is typically far down on the election ballot. In Philadelphia, the eventual winner in the race, former defense attorney Larry Krasner, received nearly $1.7 million from New York billionaire George Soros, who has spent nearly $19 million backing candidates with more liberal platforms. In Manhattan, legislation was introduced that would limit the amount defense attorneys could donate to a campaign following the 2017 victory of Manhattan District Attorney Cyrus Vance, who was criticized for accepting donations from lawyers for Harvey Weinstein and President Trump’s children. In Suffolk County, where the open seat has attracted more than a $1.2 million in donations, defense attorneys have contributed to several campaigns, including Henning’s. He has received more than $124,000 from criminal defense lawyers, prosecutors, and attorneys who practice in other fields of law like mediation and business. Outgoing Suffolk District Attorney Daniel F. Conley, who officially endorsed Henning on Aug. 18 and, along with his wife, has donated $1,000 to his campaign, pointed to the support McAuliffe has received from defense attorneys. As of Aug. 24, she had raised $314,000, 20 percent of it from lawyers, according to state campaign finance records. McAuliffe said there is a critical difference between defense attorneys and police: Police have enormous power on the streets and carry guns. “DAs directly work with and hold police accountable in being truthful, in turning over discovery, and . . . in ensuring they’re not committing any crimes in the commission of their duties,” she said. McAuliffe has said if elected she would seek to curtail donations from police to prosecutors’ races, a move she acknowledged could lead to accusations of free speech violations. “I think it’s fundamentally wrong for a candidate for DA or an incumbent to accept money from those they have to hold accountable,” she said. McAuliffe did receive one donation from police: $100 from a Provincetown detective. Mark Parolin, president of the Boston Police Superior Officers Federation, said it is unfair to single out officers for supporting a candidate. The union is not endorsing anyone in the race but he said members have come out by the dozens to hear Henning speak at union meetings. Rollins, who has raised $226,000, has received $650 from officers. Champion, who has raised about $62,000, has received $1,400 from police. But observers say the near-exclusive financial support of Henning from police raises questions about how that support would affect his independence were he elected. Henning said he would not appoint a special prosecutor because the district attorney’s office has “experienced, impartial” prosecutors who can investigate those incidents. Like other candidates, he has pledged to collect and report data on the race of people prosecuted in Suffolk and said he has a plan to reduce incarceration. But unlike McAuliffe, Carvalho, and Rollins, he is opposed to repealing cash bail and mandatory minimum sentences for all drug offenses. Henning said there should be mandatory minimums for offenses involving fentanyl and carfentanil. Henning rebutted that characterization. He said he supported the criminal justice reform bill that was recently signed into law and believed it should have gone even further, including the expunging of marijuana arrest records. He defended his opposition to a special prosecutor for police-involved shootings. Of the 20 officers investigated by Suffolk prosecutors for police-involved shootings in the last 16 years, none have been criminally charged. Their cases are available for public review and no outside law enforcement agency has ever overturned the county’s decisions, Conley said.